TORONTO, ONTARIO--(Marketwired - March 21, 2014) - Emerita Resources Corp. (TSX VENTURE:EMO) (the "Company" or "Emerita") has been awarded 90 mining claims comprising 2,500 hectares in the Asturias region in northwestern Spain following a successful bid by Emerita in a public tender (Figure 1). The licenses are valid for an initial three year period with an option for the Company to renew the licenses following the expiry of the initial period. The Asturias region has been a significant producer of gold and hosts two of the largest currently known deposits in the Iberian Peninsula, the Salave deposit and the El Valle-Boinas Carles deposit, both of which are in close proximity to the Sierra Alta Project. Gold in Asturias is hosted in three belts (Oscos, Navelgas and Rio Narcea) and occurs in high grade epithermal veins, skarns and as intrusive related gold deposits. The Sierra Alta project is located in the strongly mineralised Navelgas Gold Belt, which forms the central belt in Asturias and consists of structurally controlled Palaeozoic clastic sediments and carbonates intruded by felsic intrusive rocks (Figure 1). 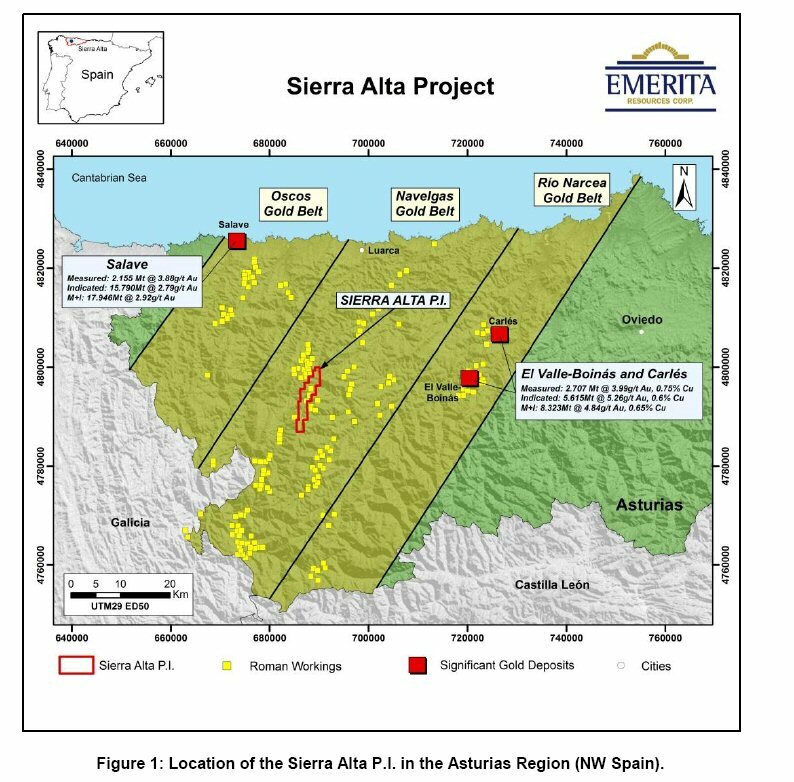 The Salave deposit, which is currently being evaluated by Astur Gold Corp., is located 35 km from the Sierra Alta Project and has a mineral resource of 17.97 million tonnes grading 2.92 grams per tonne gold, comprising 1.7 million ounces of gold in the measured and indicated categories. The EL Valle-Boinas Carles (EVBC) deposit, which lies 30 km to the east of Sierra Alta, produced over one million ounces of gold and 20,000 tonnes of copper before closure of the mine in 2006. The mine was re-commissioned in 2011 by Orvana Minerals Corp. and produced 80,541 ounces gold, 17.3 million pounds of copper and over one million ounces of silver during 2013 and is forecast to produce similar quantities in 2014. Limited exploration was carried out in the Sierra Alta project area by Rio Narcea during the 1990s and in 2005-06 as part of an option agreement. Geological mapping during this program identified a large number of ancient Roman workings that align for over 10 km length along a NNE - SSW striking structure. These range from large pits, the largest of which is the Freita pit from which 29 million tonnes of material is estimated to have been mined, to relatively small trenches. Preliminary geological mapping by Emerita geologists identified, in addition to the old workings, widespread ferruginous breccias, jasperiod alteration and widespread silicification (Figure 2). Rio Narcea also conducted soil sampling identifying a series of gold anomalies over a strike length of 8km. The largest is described as being 3km long and 300m wide and with a peak concentration of 1.2 parts per million gold. Gold mineralisation at Sierra Alta has potential for very high grades demonstrated by a 1m rock chip sample reported by Rio Narcea that returned an astounding grade of 338 grams per tonne gold. Recent rock sampling by Emerita returned grades of up to 10.65 grams per tonne gold. Historical drilling on the property is limited to four holes located in a cluster near the La Freita working. The best result was LF-02, which intersected 14m grading 2.08 grams per ton gold. Sierra Alta is located in an area with excellent access, no significant environmental restrictions and has no population centres within 5km of the property. Emerita has not yet verified the historical work done by Rio Narcea and does not intend to use this information for purposes other than planning and prioritizing exploration targets. 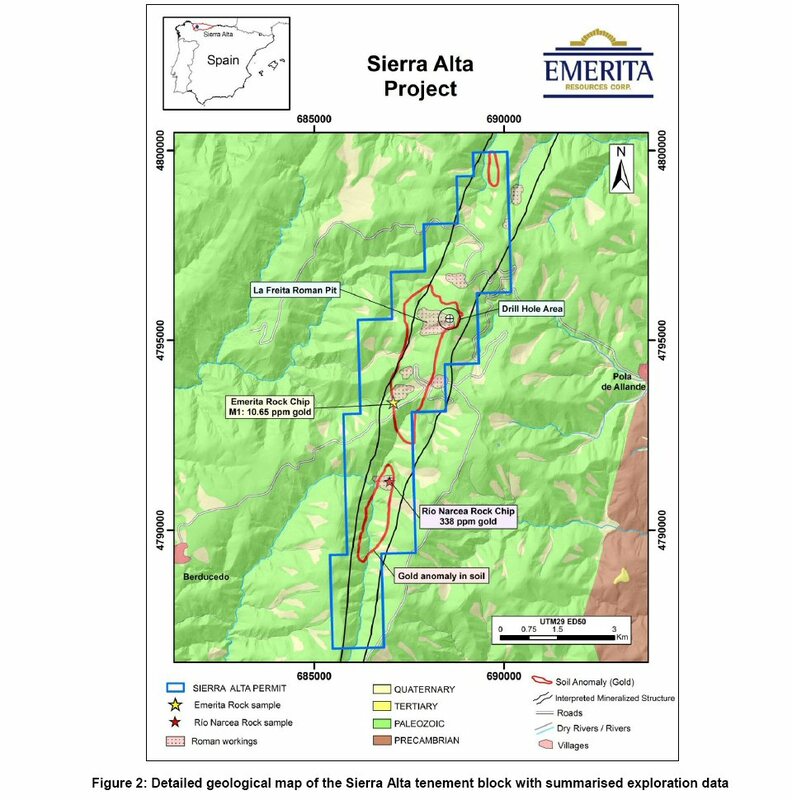 Commenting on the project, Joaquin Merino, Emerita's President and CEO states: "We are excited about the potential to find zones with exceptional grade along the untested strike length of the system at Sierra Alta, which extends for more than four kilometers based on the distribution of historical workings and soil anomalies. Initial sampling in an area having extensive Roman workings has confirmed that high grade gold values occur within the system." Emerita has also submitted a bid in the public tender for the Paymogo property in Huelva Province of the Andalusia Region in Spain, which closed on February 6, 2014. The successful bidder for this tender has not yet been announced. The scientific and technical information in this news release has been reviewed and approved by Mr. Joaquin Merino, P.Geo, President and CEO of the Company and a Qualified Person as defined by National Instrument 43-101 of the Canadian Securities Administrators. Field work at the Las Morras Property is being conducted under the direct supervision of Mr. Merino. Emerita is a natural resource company engaged in the acquisition, exploration and development of mineral properties in Europe, with a primary focus on exploring the Las Morras and Sierra Alta properties in Spain. This press release contains "forward-looking information" within the meaning of applicable Canadian securities legislation. Forward-looking information includes, without limitation, statements regarding exploration prospects for the Sierra Alta property and the Company's future plans. Generally, forward-looking information can be identified by the use of forward-looking terminology such as "plans", "expects" or "does not expect", "is expected", "budget", "scheduled", "estimates", "forecasts", "intends", "anticipates" or "does not anticipate", or "believes", or variations of such words and phrases or state that certain actions, events or results "may", "could", "would", "might" or "will be taken", "occur" or "be achieved". Forward- looking information is subject to known and unknown risks, uncertainties and other factors that may cause the actual results, level of activity, performance or achievements of Emerita, as the case may be, to be materially different from those expressed or implied by such forward-looking information, including but not limited to: general business, economic, competitive, geopolitical and social uncertainties; the actual results of current exploration activities; risks associated with operation in foreign jurisdictions; ability to successfully integrate the purchased properties; foreign operations risks; and other risks inherent in the mining industry. Although Emerita has attempted to identify important factors that could cause actual results to differ materially from those contained in forward-looking information, there may be other factors that cause results not to be as anticipated, estimated or intended. There can be no assurance that such information will prove to be accurate, as actual results and future events could differ materially from those anticipated in such statements. Accordingly, readers should not place undue reliance on forward-looking information. Emerita does not undertake to update any forward-looking information, except in accordance with applicable securities laws.